Our In-Home Volunteer Support Program offers emotional support and practical help to clients facing a life-limiting illness who are being cared for at home. The Hospice’s professional staff supports trained volunteers who make home visits. These volunteers provide someone to listen, to read, to talk with, and to take the patient shopping or to the bank, to assist at meals or to simply watch over while the patient rests. This program allows caregivers to do errands or to rest knowing that their family member is being cared for. Hospice volunteers are meant to complement existing support by family and friends, visiting nurses and personal support workers. This program plays an important role in Hospice/palliative care, especially for people who are isolated in our community. Not everyone has access to the support of family and friends. The Hospice volunteer provides client support at home or retirement home while providing emotional support or respite to family and friend caregivers. to meet your needs and then a volunteer match will be made. To make a referral , please call 613-680-0306 or click here to download a referral form or visit https://www.caredove.com/champlaincss to access services. 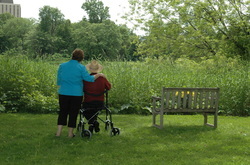 There is no charge for any of the programs at Hospice Care Ottawa, however donations are encouraged and welcomed.